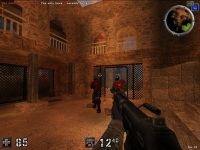 AssaultCube is a 3d realistic first person shooter game. If you're interested in first person shooters like Counter Strike, but you want to be a part of a community that's not unlike Minecraft (and with a fairly similar style, as well), you need look no further than AssaultCube. The game is fun, addicting, and best of all, free. While you can jump right into the thick of things, and go up against other players, the game is more forgiving in its single player presentation. Playing against bots with several different default levels, you can get a feel for the score of different stages. Despite the game's inconsiderable size, each one of the arenas feels fresh, lively and realistic, even though the graphical style is very minimalist. This smaller package means that nearly anyone can play the game, with no degradation to anyone else. For today's gamer, that means a lot, especially in a first person shooter, where a fair playing field is paramount. Because this game is so lightweight, it means that the community has a lot of room to experiment with it. AssaultCube comes prepackaged with a plethora of maps, but you can alter them to your heart's content, adjust various settings, and even play with the sound of the world you're exploring. Best of all, you can continue to add more stages to your collection, and they will hardly leave a dent on your hard drive. You could easily get away with playing this on an older computer. That lower bandwidth and size also lends itself wonderfully to the co-op editing that you can enjoy, in real-time. There are a lot of different ways that you can play the game, with a lot of emphasis placed on the different match types. Whether you're employing a hyper-realistic one hit, one kill match, or a horrific knife-only fight, the game has you covered. And that's just the basic single-player modes. Once you get online, you've got plenty of competitive skirmishes, including team deathmatch, capture the flag, and survival. There really is a tone of variety when it comes to this game. Even though the game is simple, it manages to make an impressive spectacle out of the stages. Each level has its own distinct look and feel, and the backdrops are incredibly expressive. You can even modify the character models if you know how. The community is deceptively vast. Just when you think your time with AssaultCube is over, you can pop over to the forums, and see just how far the supporters will go for this quirky little title. Countless pictures and videos, a wide array of FAQs and other helpful documentation and information on modding is available right on the website. AssaultCube is simple, but it is incredibly fun. It is the kind of game that you can drop right into with very little prior knowledge, and play intuitively. But it takes practice and perseverance to become one of the best players in the community. Mastering maneuvers like the Grenade Jump and the Rifle Sprint will give you the edge against your competition, as well as some extra street credit. The best part of AssaultCube has to be the fact that it is continuously growing, and you can leave your own mark on it. Enjoy the well-crafted stages, and be on the lookout for more to come from this great community! Free - open source FPS game based on Quake III arena style. Play El Diablo, Deadshot, or Harley Quinn and eliminate all enemies using their own special attack. A fast-paced first-person shooter game.